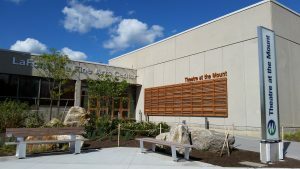 On January 16, 1976, the 3 million dollar, 41,000 square foot Fine Arts Center at Mount Wachusett Community College was officially opened, housing a 554-seat auditorium, hydraulic thrust stage, scene shop, costume and green rooms. In the fall of 1976, Professor Thomas Graves was hired as the first director of theatre. Under the name “Theatre North Central,” Graves planned an inaugural season of two shows, The Odd Couple and A Streetcar Named Desire. In early 1977, Mount audiences were treated to the first musical production to ever be presented on the Mount stage; Godspell directed by Joan Webber and produced under the auspices of the college’s Newman Association. Participation of the community, not just students was encouraged and shaped the future of the theatre as a true community theatre. The state Board of Higher Education approved a fully accredited, comprehensive transfer program leading to an Associate of Arts degree in theatre. The program offered such courses as Acting, History of Theatre and Technical Production and MWCC began accepting students that semester. About that same time the theatre’s staff was expanded with the addition of Professor Gail Steele as instructor of speech and theatre. One of her earliest and most significant contributions to the program came with her introduction of Children’s Theatre. Dr. Robert Nordvold replaced Graves as director of theatre in the fall of 1978, changing the name of the group from “Theatre North Central” to “The Mount Players.” While his ambitious goal of having a production every month was never attained, Nordvold increased enrollment in the academic program and expanded the number and quality of productions. In the summer of 1979 Professor Steele joined forces with adjunct staffers Jeff Williams and Eric Hafen to offer the theatre’s first summer season featuring productions of The Odd Couple, I Do! I Do!, Ten Little Indians and A Funny Thing Happened on the Way to the Forum. The following year, Williams, Hafen and Nordvold continued the summer theatre tradition, distinguishing it from The Mount Players with the title “Theatre at the Mount.” This period saw continued interest, bigger production budgets and ticket sales continually topping previous records. In 1983, three key decisions changed the theatre’s shape and direction. First, Gail Steele replaced Nordvold as director of theatre, merging both the academic program and the summer theatre under the “Theatre at the Mount” title. Second, the college established a trust fund streamlining the budget process and improving long range planning. Third, the need for full-time professional technical expertise was recognized in the hiring of Patrick Mahoney as resident Set Designer and Tanya Barnett as Head Costume Designer. Summer Drama Camp programs for children started in 1985 under the direction of Steele, Mary Durling, Joan Webber and Carol Couture. As the years passed, sky rocketing enrollment resulted in the addition of camp sessions for students in grades 1-12. Having learned the basics needed to perform in real stage productions, these campers provided a pool of emerging young talent for TAM. In the early 1990’s, John Konopka replaced Mahoney as Technical Director bringing new ideas and energy to TAM productions. By popular demand, TAM produced its first children’s touring show, America Before Columbus. 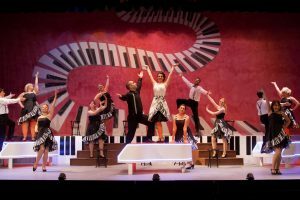 Bringing live theatre to more than forty different schools, the Fall Touring Show has since developed into a major educational outreach program. Ever-increasing ticket sales ushered in the construction of a permanent box office in the upper lobby of the Fine Arts area of the college. Shortly after Deb Anderson took over the box office in the summer of 1994, the position was upgraded to full time and subscription sales increased from around 300 to an average of 1200 annually. Theatre at the Mount received national acclaim in 1995 when Really Rosie received an Honorable Mention Award in the prestigious Moss Hart Competition sponsored by the New England Theatre Conference. In later years, The Dancing Spider and Children of Eden would receive the same recognition. In the summer of 2000, Jeff Williams, who had directed more than 65 TAM productions, was awarded a Lifetime Achievement Award from the American Association of Community Theatres (AACT). Theatre at the Mount has also been recognized frequently by the Eastern Massachusetts Association of Community Theatre (EMACT), receiving numerous nominations and awards for excellence in the DASH AWARDS (Distinguished Achievement and Special Honors). At the start of the millennium, TAM’s newly created website offered patrons the opportunity to purchase tickets online. Jeff Boisseau was brought on board as Technical Director and backstage operations continued to run like clockwork under Gail Allen. Veteran staffers like Peter Landry, Rob Houle and Susie Michaud continue to maintain the highest standards of excellence and professionalism, while newer directors and choreographers like Chris Casello, Alison Laverdiere and Katrina Caouette bring fresh, creative ideas to our stage, making our theatre more popular than ever. The highly popular “Survivor: the Musical” (created by Casello) complemented the regular TAM season for several years, raising money both for TAM and later for the Boys and Girls Club of Leominster. As the nearly 40 year old Theatre at the Mount facility began to show its age, a massive renovation project was undertaken in 2015. Patrons now experience the many improvements which include a brand new theatre entrance, expanded restrooms facilities, new box office, full accessibility to the entire theatre by elevator, designated handicap seating, new carpeting and behind the scenes – new dressing rooms, sewing room and green room. Concurrent with the renovation project, an updated ticketing system was introduced, allowing patrons to choose their own seats online. And the use of scanning technology at the entrances has simplified theatre access. 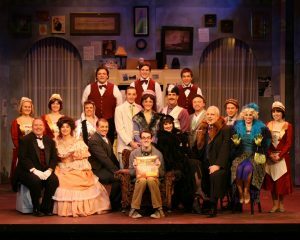 In 40 years, TAM has presented over 300 plays and had more than 2,500 different people involved in productions either onstage or backstage. 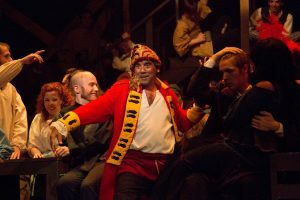 An estimated 20,000 costumes have been designed and 1,000 different sets constructed with more than a half million people enjoying community theatre at its best. 2018 – 41 years and going strong!